This cropped image shows a portion of a "Ted Kennedy" screenprint by Andy Warhol. If your art collection lacks that special crown jewel -- or if your art collection consists of only movie posters -- you may want to visit Santa Monica this weekend for a live public art auction. The auction, which features works from Ed Ruscha, Wallace Berman, George Rickey and Andy Warhol, is set for May 31 at the Robert Berman Gallery at Bergamot Station Arts Center. It begins at 1 p.m. and is located at 2525 Michigan Ave.
"It's a really fun day," Berman told the Santa Monica Mirror. "If you can't find something you like, you're just not looking hard enough." Berman told Auction Central News that Warhol's prices are "down a bit, but there's no shortage of buyers." 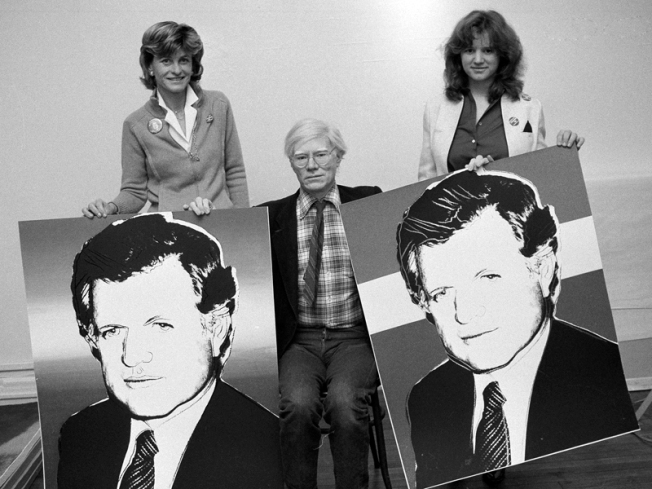 A 1980 screenprint titled Ted Kennedy (pictured) is estimated to sell for between $25,000 and $30,000. Of course, in this economy, if you can't afford $20,000 for a Warhol, don't worry. You're not completely out of the art fun. A preview party is scheduled at the gallery on Saturday from 6 p.m. to 9 p.m.